· The new loan limit that Bush put into place earlier this year will be expiring December 31st, 2008 and will be reverting to $625,000. · I have had the pleasure to help 2 more buyers purchase in the past 60 days. 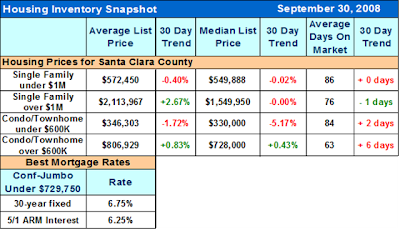 The housing stats I’ve reviewed and interest rates below show a market trend in the direction of stabilization. We currently have about a 6 and a half months supply of housing. In this type of market, deals can be made. It is uncertain where the trend is heading, but if you are purchasing for the long term, now is a great time to purchase when prices are low and interest rates are desirable. Enjoy the rest of your week and if you know of a friend, co-worker, family member or even a stranger who really wants to buy a piece of property and needs some motivation, or accountability, let me know. I’ll be sure to help them get what they want. If the table above does not appear you can click here to view it over the web.